The best way to see tint in action is to use a tint simulator, Eco-Tint has one for you to test drive! Eco-Tint exhibits full knowledge and capability of tinting any vehicle on the road today! Our industry experience enables us to tint your vehicle rear window in one piece along with micro-edge doors; you will not find any seams, butted film, or paint. Utilizing the latest technology we are able to produce laser like precise patterns to fit your vehicle so your vehicle gets the "best fit" and minimal gaps. Eco-Tint can also professionally REMOVE low grade films with out causing damage to door panels, defroster lines, or glass; an expert removal is very important if you are getting your car re-tinted. 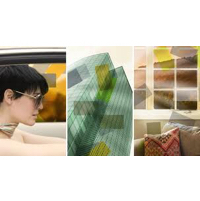 Before we tell you about what you get, know this fact: Llumar (the brand we stand behind) is the Pioneer of the whole window film industry and are tried and true! They are the best of the best, none better when it comes to quality and well built products that perform the best and has the most comprehensive warranty on the market. For instance if your looking for the best performing film on the market for your car, it is in fact the nano-ceramic CTX series; we always tell people to go to the manufacturer website and READ about the film performances and take a note that when you read about "IR heat" it is totally irrilevant, you want to know the TSER# value which is Total Solar Energy Rejected. You will be shocked at what our competitors say when you compare their words with what is on the manufacturers site, incredibly ficticious. Another worthy mention, is to understand that when you carry the best product we (Eco-Tint) spends more money and you should assume a stellar installation, in our case we are the best of the best at installations, just ask us what we do different than all the rest and then we will prove it to you. As the owner and founder of Eco-Tint, me, Mike Roades, feels that this is your hard earned money spent... I value your dollar and I value my dollar, I want you to buy the truth, literally, I want you to have the best because I feel I can deliver the best and know that we offer the highest quality films by Llumar and our installations are awesome. We are priced not the most expensive and not the cheapest, value and pricing are the best on the market! Thank you for taking the time to read this. I know there is a lot to read, an informed consumer is a happy consumer. When you call us, you are quoted for Llumar Premium ATC Film (our best seller) and approximately a 4 hour job on your car, unless otherwise specified. ATC film is a Gen4 dyed-color stable film which comes with a lifetime warranty and comes in shades from 50% 40% 35% 30% 20% 15% 5%(LIMO). The CTX film has the same great characteristics as the ATC, but has an added layer of "nano-particle ceramic" to keep even MORE heat away; and it comes in shades from 50% 40% 35% 30% 15% and 5%(LIMO). We also carry the ATR and PP series, available upon request... And yes, ECO-TINT carries all of these film in all shades in each grade. Remember, the ATC and CTX series have the same outstanding quality, same lifetime warranty, same 99% UV A/B blockage, various shades for each; BUT the CTX works better against heat and costs a little more. 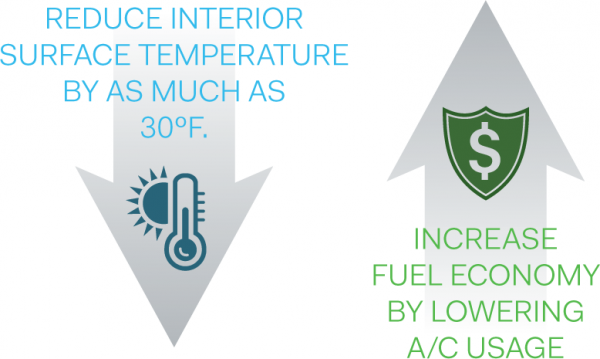 For instance the average heat blockage by ATC is 42% heat, when the CTX average heat blockage is 58% heat, AND this is a big difference especially for people who spend lots of time in the car! ALL ceramic, nano-ceramic, ultra ceramic, ceramic etc etc, and what ever you want to call it are ALL designed to store more heat and to slow down how fast the heat enters your car. You will notice the ceramic effect when you are actually IN the car moving down the road. When your car is sitting still in the parking lot all day everyday, ceramic CTX is of little benefit over the ATC. (that goes for ALL tint brands). We encourage you to check out the Nano-Ceramic AIR80 heat blocker for your windshield to get the most bang for your buck to block the heat and UV, especially if your car just sits all day in the heat you can still benefit from the UV protection! Nevada Highway Patrol Commonly Asked Questions: How dark can I go? What is the legal limit?You can tint your front doors to where the measure no darker than 28%. The rear doors or rear half of the car can be any shade. What this means is 28% light transmission, where here at Eco-Tint we can install a 30% and your right at legal, and it does better on heat than the 35% film you hear everyone talking about. We can explain this more clear if needed when you come in. Tint provides a barrier that catches flying glass from an accident or forced entry. Tint helps combat strong glare and strain on your eyes while driving. Automotive tint provides you and other occupants reasonable amount of privacy. Llumar tint extends the life of your car's interior by blocking 99% UVA/B rays! Tint protects the skin from harmful UV rays. Reducing the chances of skin cancer.